Today we look at these unusual food oils in a bit more detail. Have you heard of them all? Do you know what they are good for? I hope we can surprise you! These four delicious organic food oils are certified by the Soil Association and are available in a variety of sizes. FREE Royal Mail tracked delivery on all orders over £14 in the UK, only £1.49 tracked delivery for all orders under £14. Packed with goodness for health and vitality each oil has its own health benefits and unique flavour. Check them out below. 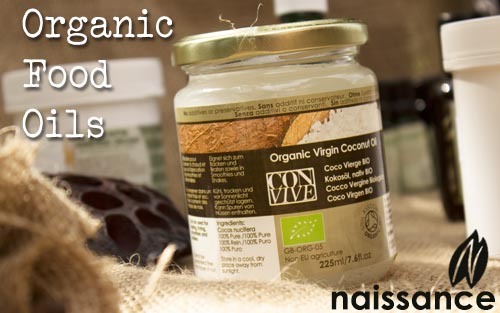 Our Coconut Organic Food Oil was a FINALIST in the Soil Association Organic Food Awards 2016. A wholesome and natural oil that may help boost your immunity and is also a delicious and versatile kitchen miracle, suitable for vegan, vegetarian and gluten free diets. Try using it for your favourite sweet or savoury dishes. When combined with icing sugar, it makes a wonderful vegan alternative to butter icing or you could put a spoonful in your coffee or smoothie for a nutrient rich morning boost. Its high smoke point makes it a stable oil when heated during baking, frying or roasting, which makes it the perfect oil for roast veggies, stir fries and pretty much anything you want to cook up. A vegetarian, vegan and raw food friendly health food. A delicious alternative to regular salad oils, its nutty flavour adds depth and can replace olive oil or walnut oil. You can even take it on its own and reap the benefits of this nutritious oil, which many people take as a dietary supplement as part of a balanced diet. As Hemp Food Oil has a very low smoke point it is best used uncooked or only lightly heated as the oil will lose an amount of its nutrients during the heating process. Although as you can see from the smoke point, it can take a certain amount of heat. Is thought to help with neurodermatitis, eczema and psoriasis because it is argued that it contains a good balance of fatty acids and omega 3,6 and 9 which can be lacking in certain people who suffer from these conditions. Rich in heart healthy omega 3, B vitamins, lignans, alpha linolenic acid and minerals. Add to your shakes or juices or food dishes and dressings. Cold pressed from the seed, Flaxseed is very high in omega-3, with almost twice that of fish oils. One of the richest vegetarian sources of natural omega- 3 fatty acids, which may help reduce inflammation and maintain a healthy heart. Contains B vitamins, which help convert food into energy. High in lignans, natural anti-oxidants to help protect body tissue. Alpha linoleic acid (omega 3) a naotural anti-inflammatory which may help stimulate circulation and helps strengthen your body's natural defences. Rich in Zinc, Magnesium, Iron, Protein and Fibre. As with all seed oils, Pumpkin Seed Oil is rich in antioxidants and essential Fatty Acids. The nutrients present in Pumpkin Seed Oil are thought to help maintain good digestive health and lower cholesterol while the vitamin A and E found naturally in the oil promote healthy looking skin. Zinc is thought to be good for allergy sufferers, zinc deficiency is thought to heighten or even cause allergic reactions. Add to salad dressings, smoothies and sauces to enjoy all the health benefits of organic pumpkin seed oil. Well, this is just a small sample of the food oils available. Do you have any other suggestions about things to look for when buying organic food oils? We, and our readers would love to hear about them.